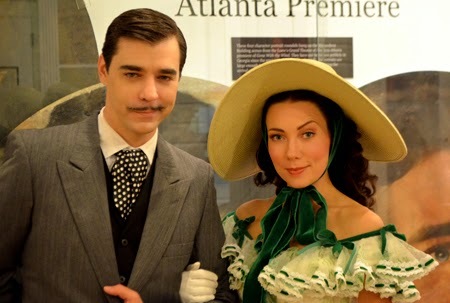 On the 113th birthday of Margaret Mitchell, famed author of Gone With the Wind, I had the honor of being a guest of the Road to Tara Museum and the Clayton Country Convention and Visitors Bureau at their Rhett & Scarlett Reunited...For the Evening event. 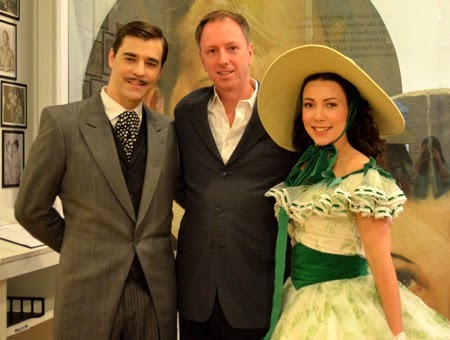 It was the first in a series of events celebrating the 75th anniversary of the Gone With the Wind movie. I've attended a lot of events, as a guest and otherwise, over the years, and this one was quite the wonderful experience. The hospitality and graciousness of everyone in attendance was remarkable. The guests and attending dignitaries were all charming, and there were genuinely friendly politicians, too! And one of the treats enjoyed by attending fans, myself included, was the opportunity to have a photograph made with Rhett & Scarlett (more about them in a moment), which were posted to the Museum's Facebook Page...some great stuff here! So, the centerpiece of this VIP Reception was the unveiling of a new exhibit and an expansion of another. 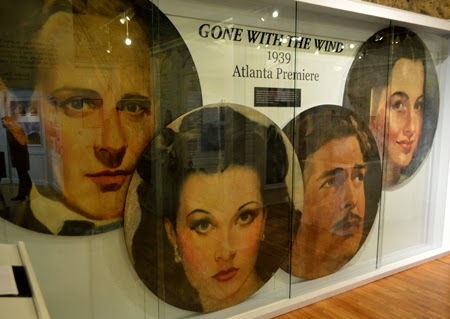 The new exhibit is the above "roudels", and this reception was the first time they'd been viewed publicly in Georgia since Gone With the Wind debuted in 1939! These four roudels, portraits of the four main characters in the film, hung on the Richardson Building across the street from the Loew's Grand Theatre during the movie premier—the largest ever in Atlanta up to that point. There was even a parade! The roundels had been in storage, after an amount of time of being exposed to the elements, but even with that challlenge the restoration is remarkable—we're fortunate to have them at all! Each is 5' tall, large enough to have been enjoyed by the thousands present at the film's debut in downtown Atlanta. I have to say, I'm impressed that the Museum focuses on so many areas of the book and film. 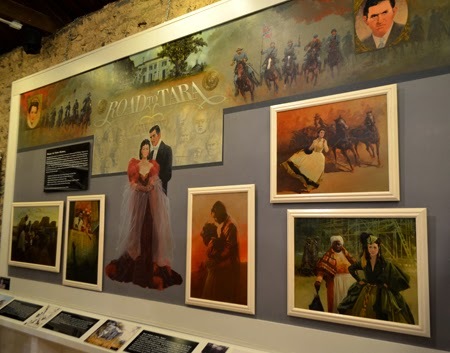 One could easily create a Scarlett O'Hara Museum designed around only Scarlett herself (surely there's one somewhere), but Road to Tara has masterfully balanced their collections to ensure a total experience for its visitors. So, when you visit, you'll certain find what you're looking for...and so much more! 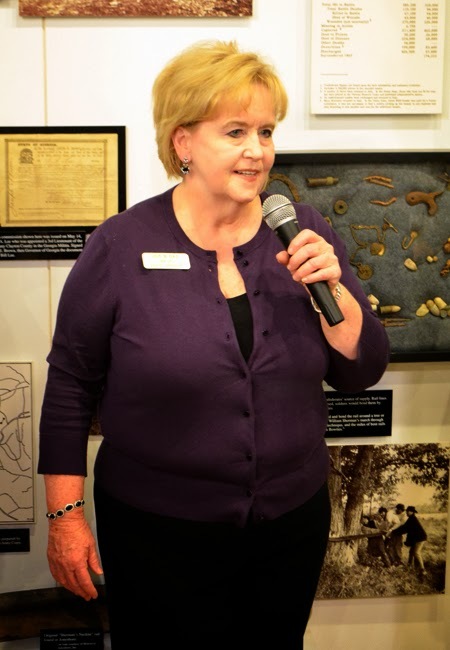 The Mayor of Jonesboro, Joy Day, was among the visiting dignitaries and offered words of excitement and encouragement...she's quite proud of what the Museum has done for the City of Jonesboro, and for good reason. I shared with Mayor Day that, after decades, Road to Tara was the sole reason that brought me to Clayton County, and it keeps me coming back. The other exhibit that brought us all together that evening was an expanded exhibit on Ann Rutherford, and her Gone With the Wind character, Scarlett's youngest sister. With not one, but two stars on the Hollywood Walk of Fame, Ann Rutherford visited the Road to Tara Museum back in 2004, at the age of 85. She passed in 2012 at the age of 94. 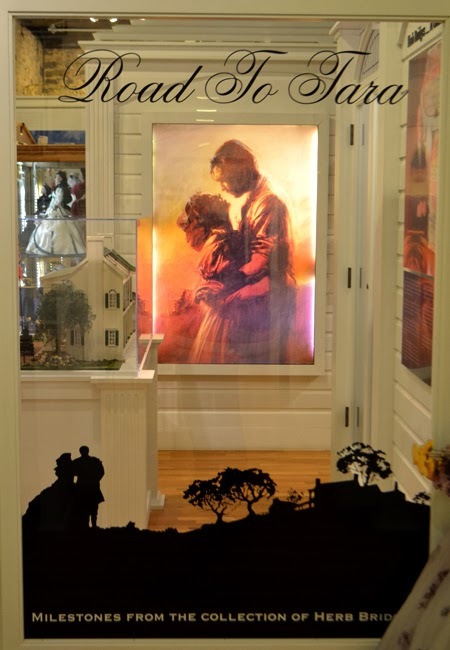 The exhibit expansion contains "one-of-a-kind memorabilia, including an original oil painting by Joseph Yakovetic, a decorative pillow adorned with Walter Plunkett's dress design, and Gone With the Wind themed colorful miniature truck, with signatures from many Gone With the Wind favorite actors." A lifelong aerospace enthusiast, I'm particularly fond of the large-scale plane photo. 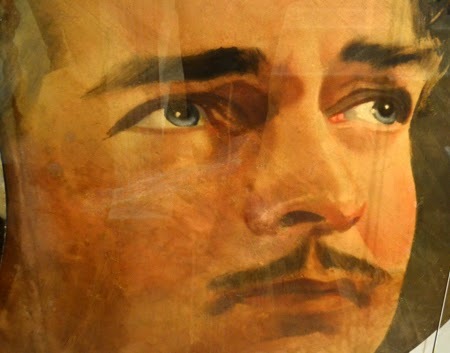 One of the unique tendencies of Nichols is to include Elvis in his paintings, which he did here, as well. 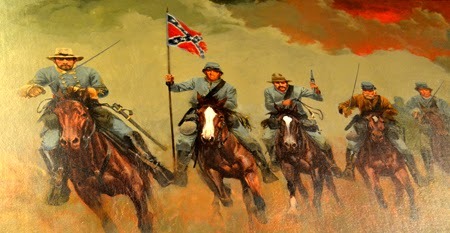 If you look closely—you can see it better in person—you'll note that the soldier carrying the Confederate flag bears the face of the King of Rock & Roll. 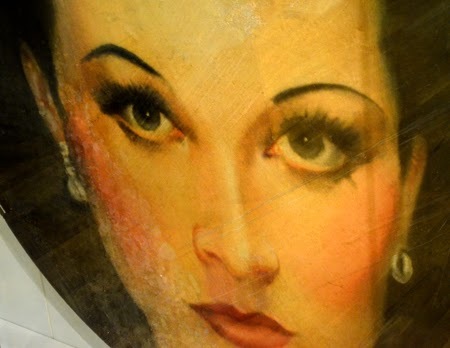 This is in the upper right corner of the mural. Rhett and Scarlett were absolutely charming. And it turns out that I've worked with Scarlett before, rather I worked with Marilyn Monroe, both portrayed by the beautiful Cynthia Evans. And Rhett was as charming as he is handsome (the ladies were all about him!). It turns out that Rhett, portrayed by Chad Sanborn, is also an accomplished magician! The two of them were magical together as Rhett & Scarlett and a wonderful highlight to the evening. Truthfully, I had more than one photo made with them...they were that fun, and so real! The Road to Tara Museum keeps bringing me back to Clayton County, which I'd not been to in decades before visiting the Museum for the first time earlier this year. A lot of that is because of the enthusiasm and kindness of Danielle Conroy with the Clayton County Convention & Visitors Bureau. She gets "community" and has made me feel welcome in hers, for which I'm grateful. I believe what will lure me back next are the tours that the Museum offers. 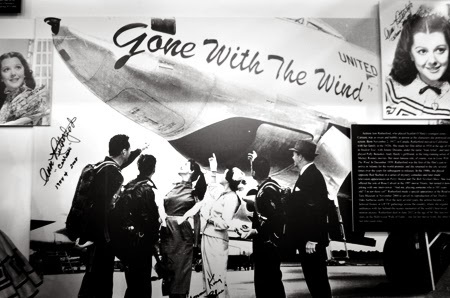 There's the "Southern Belles & Whistles Tour" and the "Gone With the Wind Tour", both of which "will immerse you in the area's history and its connections to Margaret Mitchell and Gone With the Wind."